As you may recall, it happens that recently Wan and Nyan were invited to participate in an escape-the-room competition, which is a most excellent thing for Cogito Ergo Sum's hapless pair who are always managing to get locked out of places. After passing the first challenge with flying colors (and earning an official certificate to prove it), now it's time for Wan and Nyan—and you—to go the next step: It Happens Escape Game: Intermediate Course. If you haven't played it yet (or even if you have), it's best to start with the beginner course, so you can see how Wan and Nyan ended up here, and to become familiar with how to play. Like before, you get ten mission cards to serve as hints, but looking at them is optional and almost unnecessary—almost all the puzzles are very straight forward. Wan and Nyan need to re-learn jump and punch again (of course! ), so be on the lookout for their skill books as well. While silly dogs and cats always forget their lessons, you probably haven't, which means this "intermediate" course is going to be quite easy, actually, for anyone with moderate amounts of experience playing escape games. Yet that means the series is a great introduction to the genre for escape newbies—it does make you better at escaping because it points out ways to recognize and solve oft used puzzles. Moreover, you'll also have fun recognizing allusions to popular movies and anime. Wan and Nyan take the backseat in this one, though, with less interaction and very little variation between the normal and "happy" endings. Still, it brings a smile and a relaxing afternoon break; a cheery warm-up for the more challenging escapes ahead. 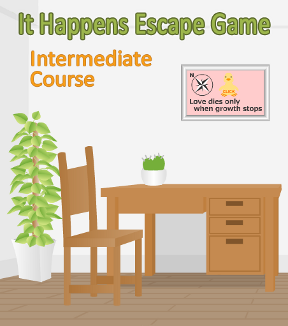 It Happens Escape Game: Intermediate Course Walkthrough now available! Special thanks to elle for the walkthrough! "Try carefully clicking the bin" and "There are times when you need to combine items." You start out in Stage 1, in front of a window and a futon. Look inside the waste basket to get a FISHING LINE. Get the FISHING ROD from under the futon's right cushion. Combine the fishing rod and fishing line to get A FISHING ROD WITH FISHING LINE. Look out the window and use the fishing rod on the sea outside. Insert THE THING into the slime-shaped hole in the wall. Get the GREEN SKILL BOOK. Read the green skill book and Wan will learn the JUMP skill (now just select the dog whenever you need to jump high). "There are times when drawers that won't open need unscrewing." From the window, turn right to face a desk. This is Stage 2. Use Wan's JUMP skill to reach a SCREWDRIVER in the upper left corner of the screen. Use the screwdriver on the screws to unlock the drawers. Get a RIPPED PAPER (1/2). another piece of RIPPED PAPER (2/2). "Letters indicating direction. N, S, E, W."
When you click on the duck, certain letters light up in the quote below it. When you click the corners of the picture frame, it wobbles. Use the clues from the picture to get the frame to fall off the wall. Top Right = TR; Top Left = TL; etc. "There are times when you need to spell out numbers"
After the wobbly picture falls down, you'll have panel needing a 3-digit number code. Notice that some letters are different colors. Using the clues on that paper, you can figure out the 3-digit number code. Together, the red letters spell FOUR, the green spell ONE, and blue spell NINE. Get the PINK SKILL BOOK. "Try paying attention to the white when looking at the painting, not the black." If you follow the hint, you will notice something distinctive about the pattern on the picture. It needs a 4-digit number code. Use the information from the picture find the code to open the box. Get the BROKEN KEY (1/2). "[Try] looking carefully at the position of the furniture that correspond with the coloured buttons." Each robot is holding a fan; when you click on it, the fan opens to reveal a different color. Here is a 3x3 grid with buttons that change color. Change each button to the proper color and the cabinet will unlock. Just match each button to the color of the robot's fan that is in the same position in the cubbies. Example, the robot in the top right corner is holding a red fan, so the top right button should be red. "Try clicking the mask once for punching order." There are two "punch" buttons on either side of it. When you click the mask, its eyes light up. Use the information from the mask to figure out this puzzle. Select Nyan and punch the buttons in the correct order to get the mask to fall off the wall. "Take note of the first letter of that month." After the mask falls off, you see a 5-digit code. But, as Nyan probably tells you, you need to look for a(nother) hint first. It's a GREEN PIECE of PAPER (and a clue); make a note of the numbers. Okay, maybe you didn't even need to look at it. But now that you have, your solution is pretty clear. Now you should be able to change each digit to a letter. Maybe you can already guess what it spells? Use the first letter for each month to which the numbers refer. Example, 1 is January, so the first digit is "J." the other BROKEN KEY (2/2). Use the SUPER GLUE on the small piece of BROKEN KEY. Then, attach the other piece of broken key to it to get simply "A KEY." Now you're ready to try the different endings. "The items you don't use have an effect on which ending you end up with." Back up and leave Stage 3 by turning right to face the exit door (which also happens to be Stage 4). You can SAVE your game here if you'd like, then try each of the endings. If you want to go back without starting from the beginning, just click the "return" arrow. Use CAT PUNCH on the red POST box. Get the "Thank You" card. That's all for now! See you when it's time for the "Advanced Course!" WooHooo!!! First ever 'first out'. Aww, I love these games. They're simple and quick but definitely a good break, and I feel successful that I don't ever need a walkthrough. Sessie, me too! Sometimes I just start humming it for no reason.